It’s Wednesday again and after last week’s extremely popular LOST bento, the idea for another immediately popped into my head. When I first started bentoing, my Allakhazam co-workers thought it was hilarious to ask something along the line of, “Who is Ben and why do you have his toe?” This horrible joke has finally done me some good by giving me the idea for my 316th “ben”to. Now, I’ve seen “bentos” of album covers cut out from nori and laid on top of rice and although they’re nice, I don’t consider them to be bentos. I take pride in knowing that my lunches are actually things that you can have as your midday meal. I should know, I eat them. Anyway, read on to see how I made this lunch in a horribly long four hours. Similar to how I did the LOST letters last week, I printed an image of Ben. I had tried to use an existing image of Ben and use Photoshop to turn it into the black and white image I needed, but it just wasn’t working out. Eventually I turned to this image and it fit perfectly. It took me two episodes of Heroes (I’d fallen behind) to finally get this right. The first Ben I cut out was way too small and you couldn’t tell what the heck he was supposed to be. I went back to the comp and enlarged the photo, printing out 6 images for me to cut up for various parts. I cut it out exactly like the image, but the shadow areas just looked terrible, so I did some impromptu trimming under his nose, near his lips, and under one eye. I was extremely happy with the results. Unfortunately, I took the photos with his left eye a little too high, but that’s just the perfectionist in me whining. I thought he looked better on the paper towel up top. Mr. Pikko was very impressed. After I was done, I folded him into the paper towel and sealed him in a ziploc bag with more LOST letters. Then I went to bed and sketched out my bento plan before falling asleep. 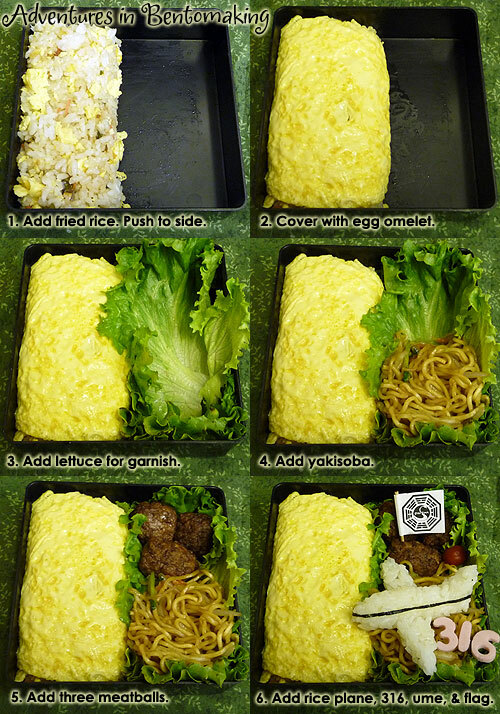 I had enough time this morning to do a Ben Bento Bentorial, hahaha! That phrase just cracks me up. This bentorial doesn’t have the nori application step because I figured this might actually be something that people don’t want to go crazy doing. 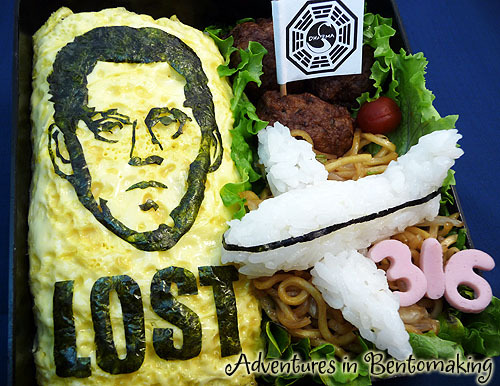 If you do, then follow these steps for making a “blank slate” bento and then put on any Lost character face you want. 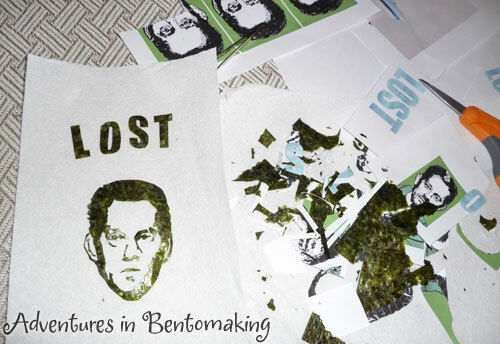 You should know what you’re getting into first though, since it took me 2 hours to cut out Mr. Benjamin Linus. In step one, I added fried rice to the box then pushed it to the side. My egg omelet is a little pock marked because I’m still egg-impaired and added too much oil out of fear that it would stick to the pan. Top the rice with the omelet and tuck the sides in. Mine was a little bit too small, but it still did the job of giving me a work surface. Next, I added some green leaf lettuce to garnish the box. Then I added a small amount of yakisoba noodles. In step five I add three meatballs. I used already cooked, frozen ones so they only required a bit of nuking in the microwave. I printed out a Dharma logo and taped it to a toothpick for a flag to stick into a meatball. I’d actually printed flags for the Orchid and the White Rabbit but it looked too busy, so I took the other two out. I had originally thought to make the plane out of kamaboko, but this soon proved to be a stupid idea, so I went with a rice plane. It was actually very easy to make. I just wet my hands and covered them in salt and shaped the body. I added the two wings after I’d placed the plane on the noodles. I added a little strip of nori to the side and made sure it wrapped around the two ends so that it looked like it went all the way around. Then I added the 316 numbers made out of fish sausage and dropped an ume into the open space next to the meatballs. I took the lunch to my lightbox and applied the nori pieces of his face with a tweezer. The kids had decided to wake up early for once, so I had two munchchins jarring my elbows going “WHO’S DAT, MOMMY?” and driving me bananas every time Ben’s eye went crooked. Anyway, there it is! Yesterday my alarm clock didn’t go off and this morning my internal alarm actually woke me up at 5:15 AM after it once again failed to go off. Turns out Mr. Pikko had turned the volume all the way down to avoid the music alarm… Good thing my brain woke me up, because it took me until 7:15 to finish this. Despite my disappointment in last week’s OMFG-how-the-hell-are-we-going-to-actually-get-them-ALL-on-the-plane rush episode from hell, I’m still extremely excited about tonight’s episode. 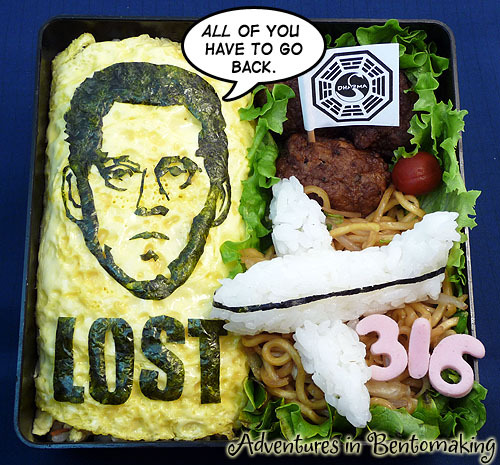 I actually hope that this bento picture somehow makes it to the eyes of Michael Emerson. It would be so freaking hilarious to creep our Mr. Creepy himself. “Oh my god, I’m someone’s lunch.” My brother saw him at Ala Moana once. Damn it! Why wasn’t I at the mall with him? He’s met/seen more Lost cast than me, the lucky sucker. I realize that since I live on Oahu, I could actually stalk the places that people say they hang out. But then I remember that I have two kids in their terrible tantrum threes and that if I were to do any staking out, they’d have to be in the car or smoothie shop driving me insane. It’s either that or I take vacation time from work, but that doesn’t make much sense since obviously they work too. That would be an amusing vacation request though. I really wish Lost wasn’t ending next year. Around 4 months ago I got it in my head that I wanted to be an extra on the show but then when I googled it, turns out I had missed the open casting call for extras by like 2 months. I suppose it’s still possible they’ll have another one for next season, but knowing me, I’ll miss that one too. If anyone can give me a casting person address to send a photo and begging letter, please let me know. I’m Asian, I could be… Marvin Candle’s ditzy younger sister? A hospital intern? I grew up on a farm so I don’t mind dirt on my face. I could be an Other?